hello, Welcome to Soul, Art & Nature. 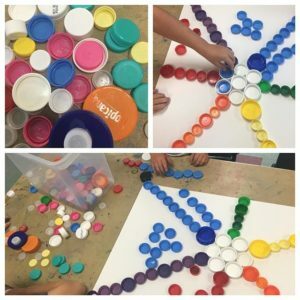 This is going to be a simple, beautiful artful journey into the wild places: where you can find a happy, colorful, and super fun ideas for kids. I will have Earth Magic Inspiration nature crafts, seasonal ideas, Creative arts & crafts, playful product ideas, and just some everyday fun. Being modern moms, I know your time is in short supply. Here, I’m going to gather the best ideas to create, celebrate, and enjoy those magical moments with your kids, saving you hours of sorting through endless websites and inspiration boards. 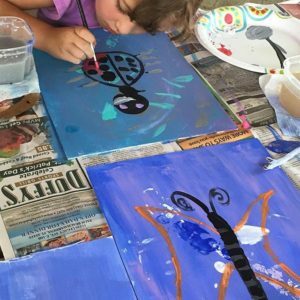 Kids love artful adventures and it’s a great way to bond and create memories with your kids. 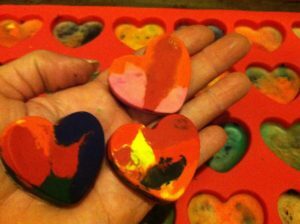 Creativity can be fun with simple supplies you already have and with nature you have lots of creative play at your finger tips. It’s about imagination, play, and fun. It’s also about everyday joys and creating memories. I hope to inspire and share ways for you to do all this and perhaps surprise you along the way. Thank you for visiting! 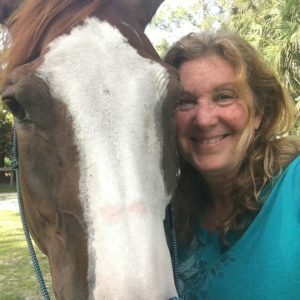 Join me below for your creative connection! I will be also be adding lists where I have gotten some of my supplies. Disclosure: Some of the links in the post will have an “affiliate links.” This means if you click on the link and purchase the item, I will receive a small affiliate commission. Regardless, we give our promise that I only recommend products or services I would use personally and believe will add values to you readers. It hurts my heart when people go about their day and not enjoy it. I know there has to be something in the day to be grateful for. We live in such a busy world and we are constantly moving. Busy, Busy. When we do stop and ask for help from our higher power, we don’t listen. It is so important to notice the little things around us, we are all trying so hard to be better, work smarter, live more fully, we ask the universe for answers of why we are not happy, wealthy, ect…we throw up our hands up in such sorrow but the God/dess does answer us, sometimes through symbols, though a song, through a random thought, so we should not make assumptions about the way Spirit can send us messages. so the man yelled, “God, speak to me! And a star shined brightly. A birthday wish comes true! A year ago today! I can’t believe it! It all started with a call for help and extra hands from a friend that is the president of a Horse rescue. It was super hot and taking a break to walk around. And wanted to go visit some of the rescue horses they have there. I just wanted to pet a horse. This was a photo Denise LeClair Robbins took of me with my first meeting with Cheyenne. Gosh this was a year ago today?! Wow! She came trotting over to me like she knew me! Not looking to fall in love but…she had me at “hello, pet me please, ignore all the others!’ I have been working with her for over 6 months now, visiting her 3 times a week. We have been working on the friendly game, yo yo, circling, backing up and just bonding , walking her, grooming and gaining her trust. new place and get some training with a trainer. She is now going to another barn where I will have her boarded at a friend’s house and get to go see her everyday to be with her grooming, spending time in the pasture and continue on a light training, to keep her entertained and happy. She basically needs lots of love and just be a horse. And you know I’m ok with that. My summer vacation…lol…This year I went on a European trip with my son. We went with a company called EF Educational tours through his high school. We traveled with 30 highschoolers and a handfull of adults as champarones. I love traveling with the kids. They were so excited to all the places we visited. Our trip started in Dublin, Ireland-Wales, London and Paris. We also had a side trip to Normandy for the D day memorials. To say we had a great time is an understatement. 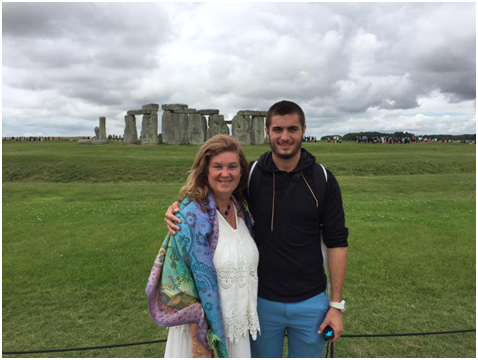 I love to travel with my Son Travis, he is 21 and always the gentleman. I shared alot of our jouney on facebook and on istagram so it I felt like ya’ll were with me. As the jouney began we left Miami and took a plane to Ireland, for 2 days, then a boat to Wales. A bus to London and visit all the sites there that I have read about in books. the London Bridge, Big Ben and the Windsor Castle. (the Queen was on holiday!) But the real reason I was excited to go on this trip was to go to a sacred spot- Stonehenge. We had a great guide that filled us in on the sites. Our guide said he and his family would come up on hoidays and picnic where the “rocks” where and he climbed all over them with his friends! It was interesting listening to the history and what they represented all through the history books. As we arrived we were droped off at the gift shop then a buss ride to the site. You can’t go in by the actually stones (only certain times) but we were able to walk around the stone structures at a distance but we could still have places to sit and meditate. As I stood there with the wind blowing over the tall grasses I was able to be still and listen and I wished peace in my heart, soaking up the love the energy of this sacred space. 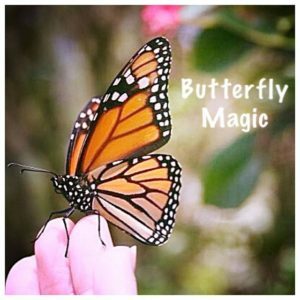 On the ride back I got the idea for a class called the Butterfly Magical Journey. I think I wrote most of it on the bus ride back to the hotel. So many notes and ideas I thought, I will share when I get home and put something together. The next day we took a tour around London town road, exciting to ride the tube to get around and then back to bed early for we took the underground train to Paris!!! So excited. Oh so young! Love him and miss him every day. 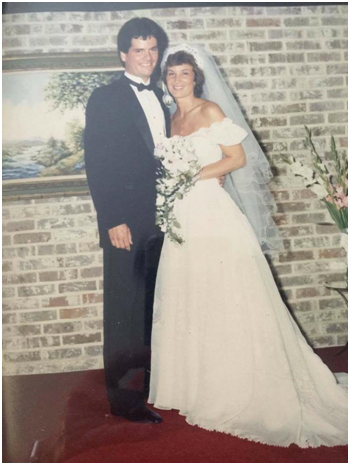 Today would have been our 30th wedding anniversary. Wow it’s been three years that Frank passed away from cancer. We had an amazing life together, 2 beautiful children and built up lots of wonderful memories. Cherish every day. I know we did. He kidded me about it sometimes but I know he enjoyed my creativity and trying to make it special. We try to stay mindful and present but life can get so crazy we forget about what the blessings are in front of us. I try not to. I give gratitude and find the magic in my day. I hope you create your life also. Living fiercely is for me about living life to the fullest-for me. and my very active fierce life came to a halt when I broke my leg in August. I always try and see the lesson in life and this one I needed some help with. We need to be able to ask for help from others when we are to deep into our…stuff! I have taken a few drumming journeys since I have had my broken leg. Going back to my fall on the mountain back in Canada during a shaman initiative. I’m always Asking questions and digging deeper. It seems this time of year there is usually something going on that I get hurt. 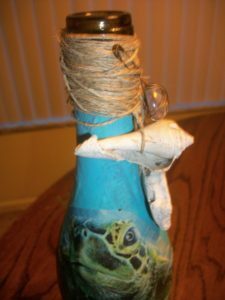 So as a Shaman I journey for myself with the help of my mentor Michele Grace Lesaird and a few things have come about. Very enlightening really. One thing is the falling down and now with my broken leg is all about grounding and balance. I tend to overdo like many of us between family and work, well it’s a stressful time. I needed to reclaim my life through creativity. It seemed simple enough so why was I fighting it? Feeling of fear, vulnerability of the sharing my heart though my art is terrifying! But you know. We are all artists; we create everyday and I am the artist of my life. 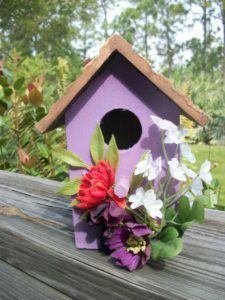 I can create a warm and welcoming home, I want to offer classes and workshops. Have people over for dinner and have fun enjoying each other’s company. I want to Share the magic; inspire friends to think about their life as art! 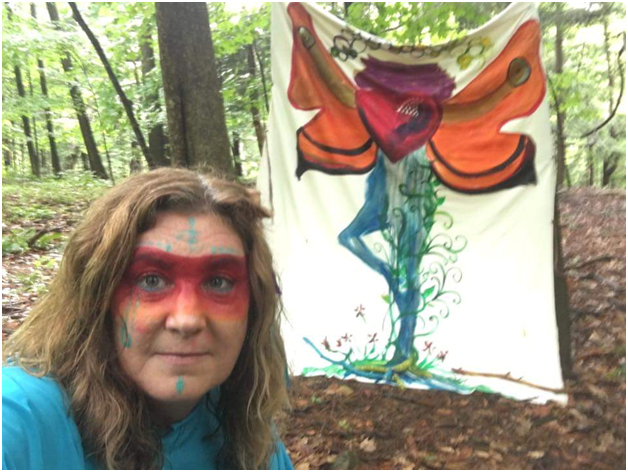 Magical forest filled with Soul Art Shaman! 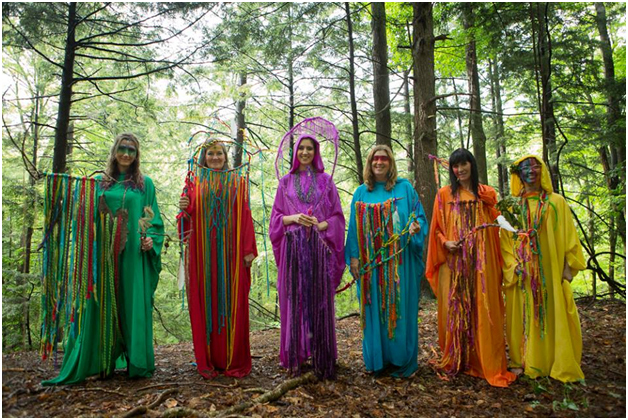 I had an amazing time this Spring in Canada with Laura Hollick and the other Soul Art Guides. I have been on this journey with her for over a year now and I was invited to be part of the shaman intensive in her studio: In CANADA! I was so honored to go there and explore deeper into my art and my life journey. As always though we sometimes learn the lesson many months from planting the seed of wanting to know and help us to grow and fulfill our life goals. On this particular day we got dressed up, had our make up done and headed to the mountain to take the experience outside. On our way out the door the scariest thunderstorm seemed to come out of no where! The wind was blowing the rain was coming down in buckets! It was scary. As we got to the entrance to walk up the mountain the sun came out and it was sunny. Climbing up the mountain in silence and in thought we came to a fallen log on the path as I was crossing it I slipped and fell to my knees. Not hurt except my pride. You see I never fall down! I got up and walked on and asked for a message…but we got busy putting up our nature art gallery and getting ready for the ceremony. A magical time with everyone sharing their gifts and what magic they wanted to bring into the world. After we gathered our Body Mapping we started down the mountain back to Laura’s studio. We got to the place where I fell and we all remembered and I was so careful I went to the side to get better footing on the grass….I said “whew I’m safe” and you guessed it. I thought I was going to slide down the mountain on my bum. And yes cameras are there, so thank you very much! They got a picture. I really was full of mud. A good baptism from the mountain for the rest of my journey. Bonjour! 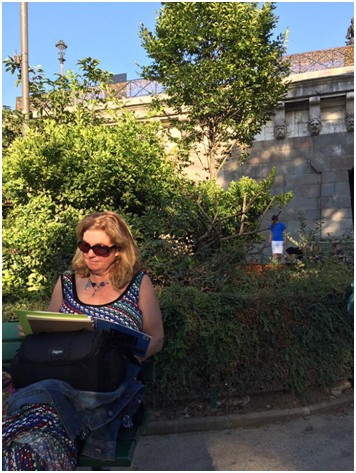 As an artist drawing/painting in my art journal in Paris! was a dream come true that I really hadn’t even fully realized I wanted until I got there. What artist doesn’t want to go to the streets of Paris and well be an Artist! But Paris wove her spell around me and I felt at home. The people, the language of love, now I tried to speak a little and I loved the sound of it all around me. Very magical time indeed!